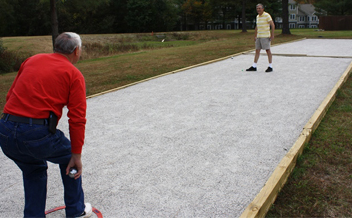 Petanque/bocce courts are now available at Mid County Park in James City County. JCC Parks and Recreation provided court space and construction materials and the Mid County Park Petanque Group members built the courts and will maintain them. Petanque can be played by two teams of one to four players. Metal balls, known as boules, are thrown with the goal of placing them closest to the target. 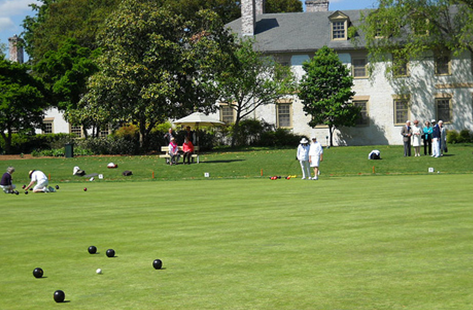 The courts are open during park hours and players should bring their own boules and equipment. If you prefer to play with the Group, games are held every Thursday and Sunday at 2 p.m. For those wanting to try out the game, there will be instruction and extra boules available. Two Rivers Country Club will sponsor a speed, agility and conditioning camp on July 16-19. The camp, which will be held from 9-10:15 a.m., is open to young athletes who compete in soccer, tennis, lacrosse, football, basketball or other sports. Cost is $55 for TRCC members and $60 for nonmembers. 10 a.m. to 12 noon. The Flora Foray will celebrate the publication of Flora of Virginia, a landmark botanical reference book which describes 3,164 plant species and natural variants growing wild in the diverse habitats of the Old Dominion. After discussing the Flora of Virginia, Ware will lead a foray through New Quarter Park’s forests and ravines to find living specimens of some native Virginia plants described in the Flora. The Flora Foray is part of New Quarter Park’s 2013 Saturdays in the Park education and recreation program series. The 545-acre park includes diverse mature forest, ravine, and wetland habitats. Geocachers navigate to specific sets of GPS coordinates and attempt to find the Geocache container hidden at a location. 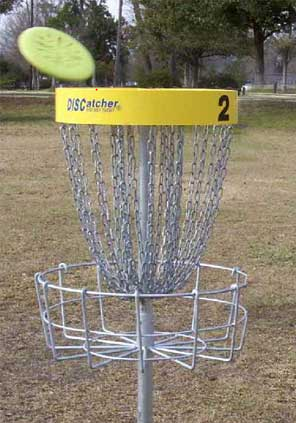 There are about a dozen caches hidden at New Quarter Park and about 60 others located within 5 miles. But that’s not all: geocaches are hidden in nearly 2 million locations worldwide. Geocaching is a great way to see places you wouldn’t normally find. It’s a great activity for families, Individuals, or couples. Kids of all ages love a good treasure hunt! Well,. its no Rockefeller Center but Williamsburg’s first outdoor Skating Rink opens in New Town, this Friday Nov 23rd at noon. 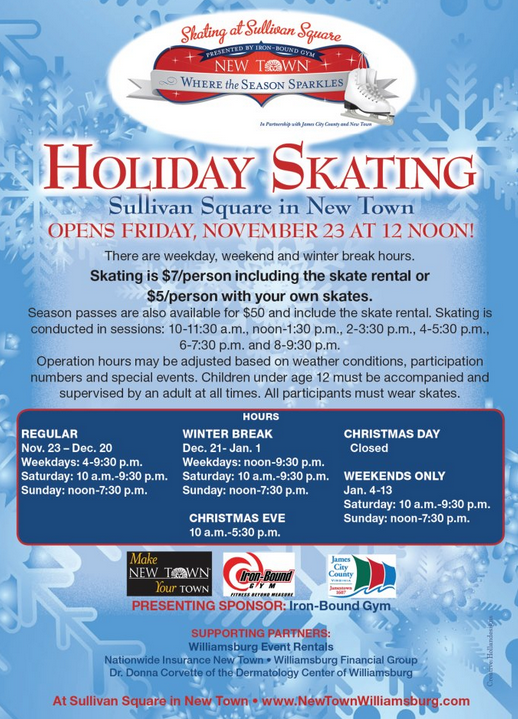 Presented by Iron-Bound Gym in partnership with James City County and New Town the synthetic rink will be open seven days a week until January 13th, 2013. Skating is $7/person including skate rental or $5/person with your own skates. All participants must wear ice skates. Season passes are also available for $50/person and include skates. Children under age 12 must be accompanied and supervised by an adult at all times. See below for more specifics…. So “Does it look like real ice?” from a distance it looks like the real thing, Up close, the plastic panels appear snapped together like puzzle pieces. So what’s it like to skate on synthetic ice ? While I am not a skater bit it felt hard to move your feet. It didn’t feel as slippery as real ice so you can’t go as fast. which is probably a good thing. When you stop moving your feet you stop moving, so you don’t have that overwhelming slipping feeling. No one claims it exactly replicates ice. There’s a resistance. You’re actually pushing off and stroking harder. I am told the surface is good for training because beginners become “stronger at a faster rate. The rink uses a plastic polymer injected with oils that are released “when the blade heats up and melts the top layer of the polymer. It should become slipperier as more people skate it. Williams has inspired many area residents to get excited about birds and to learn to identify them by field marks and calls. During walks he will point out osprey, heron, ducks, eagles, and hawks on Queens Creek and will help participants learn to listen for and spot songbirds in the park’s woodlands and meadows. The free walks along the park trails will intrigue young and old as they enjoy the area’s natural environment. The $600,000 Virginia Derby at Colonial Downs in New Kent is the richest and most important race on the Virginia racing calendar. In addition to being one of the largest social events in Virginia it also annually attracts the best 3-year-old turf horses, jockeys and trainers in the nation, including two champions and three Breeders’ Cup winners in just the last five years! New this year for the Hoot on the Hill party zone are tailgating spots for $100. You and your friends can enjoy a true tailgating experience with this new option at Hoot on the Hill. Regular admission to Hoot on the Hill is $10 per person if you walk in from the parking lot. And as before, the Hoot on the Hill area is a BYOB area, so bring your coolers and all the refreshments you will need for the evening, as well as portable chairs and pop-up tents. There will also be betting stations, and two jumbotrons for better viewing of the races. 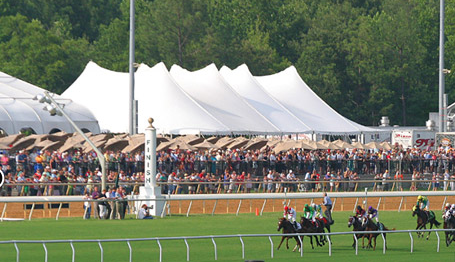 The 2012 Virginia Derby is on July 21 this year. Gates open at 4 p.m., and post time is 5 p.m.! No Limits Skydiving West Point"
Skydiving school in Virginia with locations in Victoria and West Point, VA. Come enjoy the thrill of a lifetime by making your first Tandem Skydive with a United States Parachute Association certified instructor. There is no better feeling then taking that first step out of a perfectly good airplane. 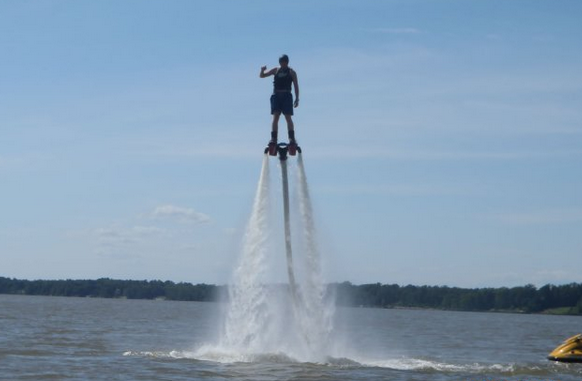 The view in freefall over West Point is amazing, we jump right over the Mattaponi, Pamunkey, and Yorktown River. Both of our locations are open 7 days a week, call anytime for questions or to make your reservation. We hope to see you in the sky soon with "No Limits Skydiving"
The Williamsburg Bird Club has over 200 members in and around the Williamsburg, Virginia area. Meetings are held once a month (except in the summer) in Room 150, Millington Hall at The College of William and Mary. Bird walks are held twice a month at New Quarter Park, and we have a monthly field trip to different locations throughout the year. Share the joy of birding with others. New members joining in May through August pay 1/2 dues initially; those who join September through December pay no dues initially. A 4.7-mile soft surface hiking trail which consists of three interconnecting loops through rural land. The trail has a boardwalk over a beaver pond, is located 1/2 mile from Jamestown Island, and adjacent to Mainland Farm, the oldest continually operated farm in America. The trail is being developed through a coordinated effort utilizing volunteers from the community, various state and national grants, and local resources. Green Springs Trail is located on John Tyler Highway behind Jamestown High School. Look for nesting osprey, warblers, woodpeckers, swallows, and more. Directions: If approaching from Newport News, follow Interstate 64 W to Exit 242A. If approaching from Richmond, follow Interstate 64E to Exit 234. Both of these exits access Route 199. Follow Route 199 to Route 5 (John Tyler Highway). Turn left and follow Route 5 to Jamestown High School at the intersection of Legacy Drive. The trailhead begins behind Jamestown High School at the tennis courts. A 20 mile road that runs from Jamestown to Yorktown, mostly along the James and York rivers, with many parking pull-offs; expect almost anything in the varied habitats. A 3-mile and 5-mile, one way loop road through viney woods and marshes, with parking pull-offs; excellent for woodland species and waterfowl. Directions: When traveling east or west on I-64 take exit 242A (Route 199 West). At the second stoplight, S. Henry Street, turn right. Make another immediate second right, about 50 feet from the first right. This will take you to the Colonial Parkway. Turn right onto the Parkway and follow it to its end and the Jamestown Entrance Station. A wildlife management area on the shore of the James River, just south of Williamsburg, in Surry County. Most easily reached by the Jamestown Ferry, with observation platforms and walking trails; great for shorebirds and waterfowl. Access to the area is through the Surry Nuclear Power Station from state Route 10, between the towns of Surry and Smithfield, north via Routes 650 or 617. 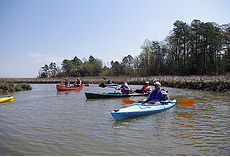 York River State Park offers visitors an opportunity to experience the environment of a coastal estuary. This park is known for its rare and delicate environment, where freshwater and saltwater meet to create a habitat rich in marine and plant life. The main focus of the park is to preserve a portion of York River frontage and its related marshes while providing an area for passive day-use recreation for visitors. York River State Park served as a role model for all of Virginia’s state parks in developing resource management plans. Expect just about any kind of birds except shore birds. Directions: The entrance is off Route 606. From I-64, take the Croaker Exit 231B. Go north on Route 607 (Croaker Rd.) for one mile, then right on Route 606 (Riverview Rd.) about one and a half miles to the park entrance. Take a left turn into the park. A 545 acre preserve that includes mature woodlands and open meadows, habitat that supports a diverse population of plants and animals. The park sits on a bluff of fossil shells and is surrounded by tidal creeks and marshes. Located at the end of Lakeshead Drive near the Queens Lake neighborhood. From East: Take I-64 West. Take exit 242A (Route 199 West/Jamestown Exit.) Take the Route 143 exit off of Route 199 (the first exit) , turn right onto Route 143 and follow it until you come to the first stoplight, which is the Penniman Road intersection. Turn right onto Penniman Road (Magruder Elementary School is on the left) and take the first left turn onto Hubbard Lane. Stay on Hubbard Land for about a mile an until you go under an overpass just past Cobble Creek subdivision. After the overpass, make an immediate right turn onto Lakeshead Drive. Follow this road until you reach the park. From West: From West: Take I-64 East. Take EXIT 238 toward US-60/ CAMP PEARY / COLONIAL WILLIAMSBURG. (0.1 miles). Merge onto VA-143 E toward WILLIAMSBURG / JAMESTOWN / YORKTOWN. (1.1 miles). Stay STRAIGHT to go onto CAPITOL LANDING RD / VA-5 S. (0.3 miles) Turn LEFT onto PARKWAY DR / VA-163. (0.4 miles) Take the ramp on right toward YORKTOWN (0.1 miles). Turn RIGHT onto COLONIAL PKWY / COLONIAL NATIONAL HISTORICAL PKWY. (0.8 miles). Take the ramp toward QUEENS LAKE. (0.1 miles). Turn RIGHT onto HUBBARD LN / W QUEENS DR. (0.1 miles). Take first RIGHT onto LAKESHEAD DR. and follow this road until you reach the park. Located on Route 633 off Centerville Road. Only 2 small pull-offs, but a great location for waterfowl and for swampy forest dwellers such as warblers and flycatchers. On the campus of the College of William and Mary, adjacent to Lake Matoaka; enter from Compton Drive off Monticello Avenue. Area supports waterfowl on the lake and species that like mature oak and beech forest. The entrance is on Airport Road between the intersection of Route 645 and Rochambeau Road. Picnic areas and trails through mature woods are excellent for thrushes, vireos. Warblers, flycatchers, tanagers, and more. Two islands on the shore of the James River off Route 5 near the intersection with the Chickahominy River. Protected by a conservation easement held by the Williamsburg Land Conservancy; boardwalk across marsh and trails through the woods are good for warblers, wrens, and ducks. Off Francis Street in Colonial Williamsburg, behind Basset Hall; stream, woods and a freshwater pond: look for wrens, thrushes, woodland birds. 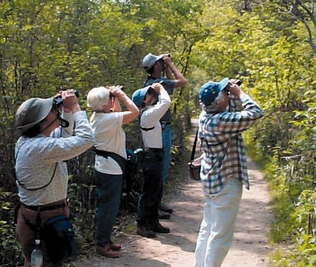 The Williamsburg Bird Club and New Quarter Park co-sponsor bird walks at New Quarter Park, 1000 Lakeshead Dr., Williamsburg, twice a month — the second and fourth Saturdays. The second Saturdays we meet at 8 a.m; the fourth Saturdays we meet at 7 a.m. Meet in the parking lot near the park office. Participants can stay as long as they’d like. Generally, the leader will walk about two hours or so, but participants can peel off as they like. Walks are free and open to the public. You need not be a member to join us. Just show up! Google map. It’s going to be windy with a high in the 50s — a great day for a walk in the woods with your favorite birding friends. Environmental educator Hugh Beard, science teacher and member of the Williamsburg Bird Club, will be our leader. See our latest Calendar of Events for other upcoming activities. The James City County 4-H Archery Club promotes youth interest in natural resources and related natural sciences programs through archery target shooting. Students learn safe and responsible use of archery equipment to develop decision making, self-discipline, and concentration. Participants learn about range and equipment safety, eye dominance, parts of the bow, parts of an arrow, basic archery form, and development of technique. The 4-H Archery Club holds two monthly meetings throughout the year and provides the opportunity for youth to prepare for and to compete in the State 4-H Archery Shoot. The 4-H Archery Club provides all equipment necessary for participation. In order to maintain and purchase future equipment, a fee of $30 per season will be charged. There are scholarships available for those that qualify. The club is also looking for responsible adult volunteers to become trained as 4-H archery instructors. Fees will be waived for adults that commit to volunteering for two seasons as an instructor. Click here for the 2011 – 2012 4-H Archery Schedule! Click here to email the 4-H Archery Club Leader! As previously reported in Jan 2012 , Go Ape, a treetop adventure company, is breaking ground on its second U.S. location. The new course will be located at Freedom Park in Williamsburg, VA, a convenient location for the area’s millions of tourists. Go Ape launched its first U.S. course in May 2010 in Rock Creek Regional Park in Rockville, MD. Since then, more than 30,000 people have monkeyed around in the trees. The eco-educational outdoor experience will provide visitors with 2-3 hours of outdoor fun and exercise while they navigate through the treetops. The course will span seven acres and feature five ziplines, two Tarzan swings, and a series of rope ladders, bridges, swings, and trapezes, all situated in the treetops of Freedom Park. In addition, Go Ape is excited to reveal new obstacles that will be the first-of-their-kind in the U.S., including a 600 foot long zipline. Catering to all skill levels, Go Ape is ideal for friend and family outings, corporate team building, birthday parties, date nights, bachelor/bachelorette parties, school groups, scout events, and church groups – basically anyone who is looking for a fun and exciting activity that gets them into nature.